The year is 40.000. Peacefully floating around in zero-gravity Barbarella (Jane Fonda) is suddenly interrupted by a call from the President of Earth. 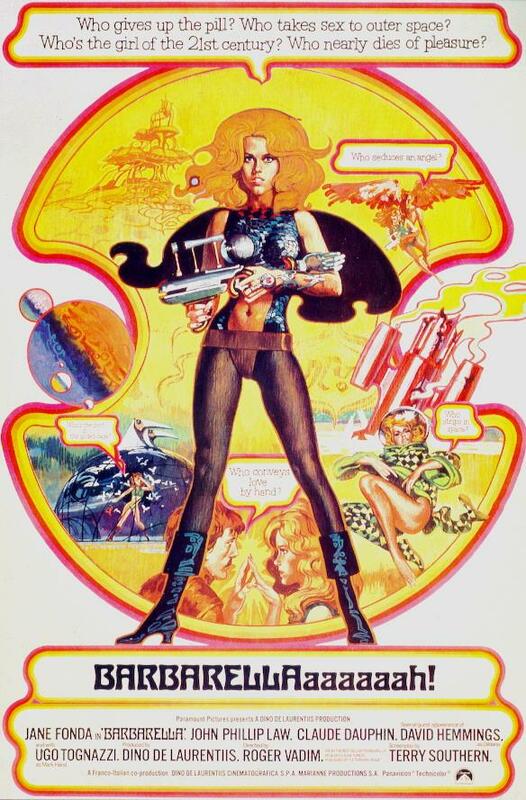 A young scientist, Duran-Duran, is threatening the ancient universal peace and Barbarella is the chosen one to find him and save the world. During her mission, Barbarella never finds herself in a situation where it isn't possible to lose at least part of her already minimal dressing. "Barbarella/psychedelia!" Based on the French comic(later translated and brought to America), this film is pretty much in keeping with the strip--right down to the dialogue and set-designs. Too bad director Roger Vadim has a lethargic sense of pacing and no sense of humor. Scenes that should work DON'T(like the evil chomping dolls or Barbarella's first meeting with Dildano[David Hemmings]). I loved the sets, the costumes, and Jane Fonda in general: she's a little too brainy for a feather-brained farce, but she's game and gets in some wicked lines. Ugo Tognazzi(as the hairy hunk Mark Hand)is obviously dubbed--he sounds like a robot at Disneyland--but John Phillip Law is rather sweet as the blind angel Pygar and his flying/battle sequence with Jane in his arms is wonderful. 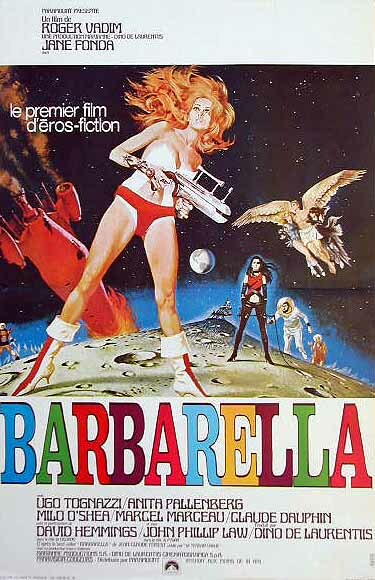 There are few(if any)movies that look or sound like "Barbarella". It's one-of-a-kind, for better or worse. ***.